Art of Rolling Finger Skates Revealed! Exclusive First Look. Art of Rolling is always dedicated to representing rollerblading and our New York scene. Check the exclusive first look of the custom hand made finger skates created by Angelo and Layla Ferrer including a dedicated skate to our good friend Cozmik where the proceeds will be going to his family. “The Art of Rolling Magazine team is constantly looking for unique and creative ways to support the rollerblading community. This time, we are releasing our new line of Art of Rolling Pro Finger Skates to help the skaters themselves gain exposure, as well as to contribute to the printing of Art of Rolling Magazine. These skates are professional one-of-a-kind handmade finger skates for your enjoyment with featured New York City riders such as Anthony Soto, Ramelle Knight, Alex Nunez, Jesus Medina, Chauncy Jenkens, Victor Callender, John Stephens and many more. We also have, for a limited time, Brian “Cozmik” Scott Pro finger skates that will serve as a tribute to the late NYC skater. All proceeds from the “Cozmik” skates will go directly to his family as an acknowledgment of his everlastingly important role in NYC skating. In addition, a percentage of the proceeds from each pro skate sold will go directly to the skaters as an acknowledgment of their hard work and incredible talents. If you thought that was all, THERE’S MORE! We are also open to custom made skates that you can order with custom laces, cuffs, buckles, soul plates, frames, etc upon request. This, however, is on a first-come –first serve basis so don’t miss your chance to own a pair of your very own Art of Rolling Finger Skates. For more information please contact nyrolling@yahoo.com or visit us at our website www.angeloferrer.com/artofrolling. Keep posted and don’t miss out!” Show your support for AOR and your local NYC skaters and get your pair of Finger Skates today! 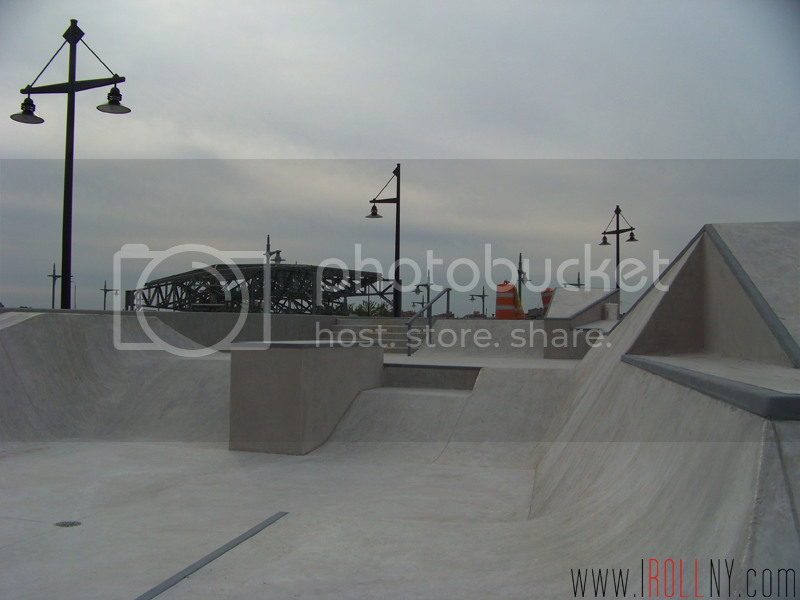 Thanks to Victor Callender for pulling a B&E (no not bacon and eggs) and taking these exclusive up close photos of the newly constructed Pier 62 skate park in Manhattan, NY. The terrain looks great, all cement based on the photos, but the grinding material doesn’t look too ideal for us skaters. The edges seem to be painted cement rather than angle iron or metal railing which is usually used for parks. Maybe i’m wrong. Check the rest of the photos after the jump. I Roll NY Exclusive: “This is skating” Tee! This new design is a concept that I’ve been wanting to make for a while. This shirt sends a clear message to those uninformed/ignorant audiences who always refer to me, you, and everyone else on rollerblades as a skateboarder. We’re clearly on rollerblades and to make it even more obvious the message on the shirt confirms that simple little fact. The shirt also has a neat little feature. 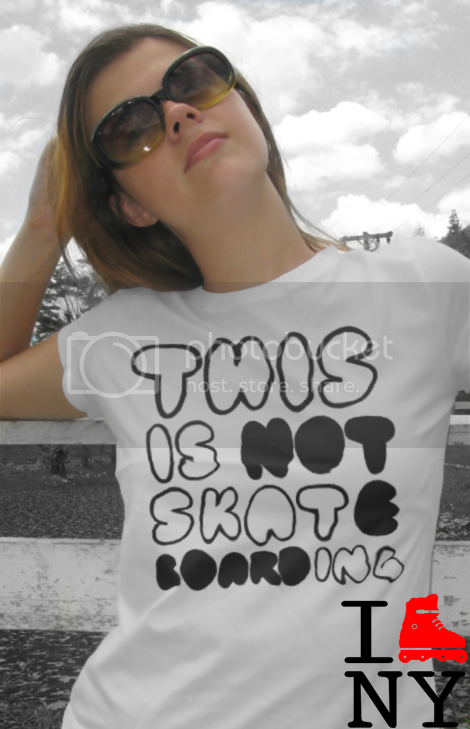 When read first, the shirt reads “This is not skateboarding.” When only the clear letters are read the shirt reads, “This is skating.” Up is a sample that was done. More news on the new I Roll NY line will be coming soon. Hope you enjoy. One of rollerblading’s most unique skaters, Ben Schwab, will be receiving his own footwrap from skate company, Xsjado, said to be released this summer. As you can see in the photo above the approach seems to be a more casual basic sneaker design that looks wearable outside of skating. In other prototype news, Sean Kelso originally posted a full boot picture of his USD prototype which is said to glow in the dark but then later changed it to this cropped version. It’s not for certain if the whole setup can glow in the dark but rumors are that only the cuff will be able to. As well, according to SK, via the be-mag messageboard, these will not be coming out anytime soon and it’s no surprise seeing as how most USD’s riders are currently skating the Deshi carbons.